Calcified Granuloma is a healed tubercular or cysticeroid lesion in brain showing dystrophic calcification. * In Neuroradiology, CT is most sensitive and specific as far as calcification in any lesion is concerned let it be infective or neoplastic. Calcification on MRI has variable appearance depending on density of calcification and sequence. A faint calcification in a lesion if any may not be seen on MRI. A dense calcified nodular Granuloma if at all seen on MRI, is seen as punctuate low signal intensity on T2*GRE and T2w images. However MRI can confuse a calcified Granuloma with micro bleed or a petechial bleed which are also seen as punctate low signal intensity due to hemsiderin staining. So sensitivity as well as specificity of MRI debatable as far as calcification if concerned, let it be SWS (Susceptibility Weighted Sequence). In such situation it is better to run few thin axial CT sections to confirm the Granuloma. * Role MRI in case of calcified granuloma is whether the lesion is active or not, by depiction of perilesional odema or contrast enhancement if any which may not seen on CT. On CT the calcified granuloma is dense white as well as enhancement also appear white so if at all the lesion is active, any enhancement is there, it will not be seen in the dense white back ground of Granuloma on CT.
* While evaluation of size again discrepancy is seen between CT and MRI. CT considered to be more accurate. In MRI discrepancy is seen among its different sequences itself due to over as well as underestimation of calcification. A dense nodular calcified Granuloma in right superior frontal gyrus on CT measures 3mm, no perilesional odema. 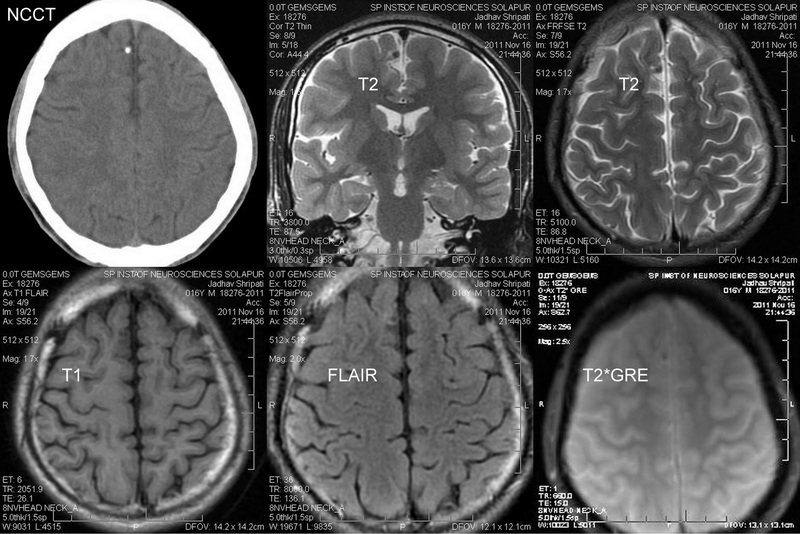 MRI show a punctuate low signal intensity on T2w images and faint low signal intensity on T2*GRE. An obvious discrepancy is seen in size of the lesion between CT and MRI, even among different sequences of MRI it self. Lesion is not very obvious on T1 and FLAIR. There is no perilesional odema on FLAIR. Among CT and MRI no one is superior or perfect ; both have some advantages and limitations. CT is more sensitive to pick the lesion, where MR may miss lesion if the lesion is small or calcification is faint. MRI is more sensitive than CT to evaluate activity of lesion by demonstrating perilesional odema and enhancement. For evaluation of size of calcified Granuloma, CT appears to be more reliable than MRI. A foot note : Please even if u are dealing with any normal MRI brain study always review previous CT brain images of the patient particulary if patient comes for evaluation of seizures disorder.